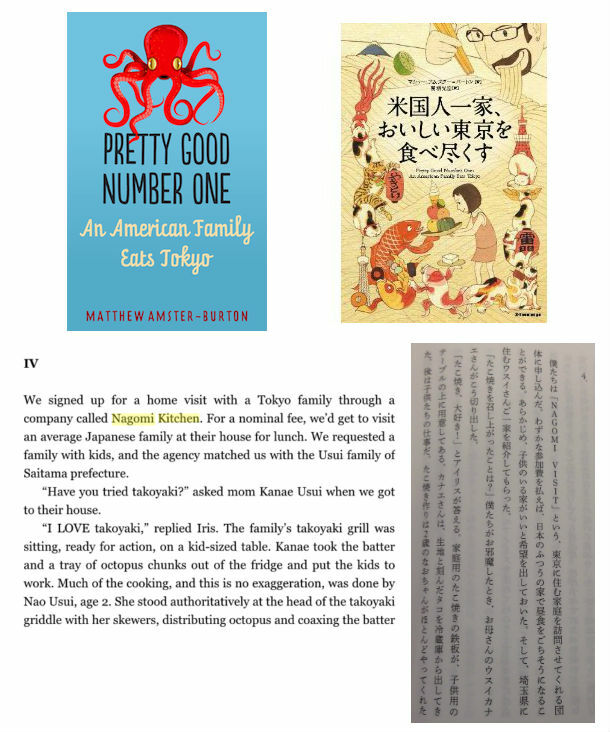 Our past participants will do a better job of letting you know how they felt about their Nagomi Visit so make sure to look around for reviews scattered all over the internet, whether it is on Trip Advisor, Twitter, Facebook, Instagram, blogs, books, television, about their Nagomi Visit so take a look. 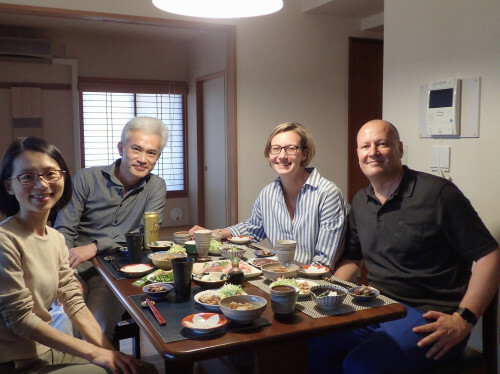 But remember, as a past participant put eloquently "[a Nagomi Visit is] an interaction between friends...partially dependent on how you make it" so get creative with these tips because there are many ways to enjoy a Nagomi Visit. Our Facebook page will also give you a feel of what our program is all about. Kumi and her husband Masato were such great hosts. Funny, entertaining and very friendly. From the moment we met them at the train Station, with their 2 children, we knew that we were going to have a good time with them. And it turns out to be absolutely true. We had great conversation and very interesting discussions. My wife and I, being both culturally mixed (Europe and Africa), we were really interested to learn about the Japanese way of life. We learned many things about the region of Kansai, the city of Akashi. But our most stunning discovery was about the meaning of the famous KAME HAMEHA (from the Manga Dragon Ball). We don't want to spoil it so we'll keep the secret! Actually we have 2 memorable moments. When we arrived at the train station, we were ahead of time so we went outside to get some shots of the surroundings. And while we were filming, our host arrived and recognized us. Such a lovely moment! Seeing the kids of our host, mastering the fidget spinners we offered them 2 hours earlier. It's impressive kids can pick up things so quickly. We decided together to book a Nagomi Visit (we saw it on a German TV show about traveling in Japan) and we were both very excited. We liked the idea immediately and were convinced from the concept. We had a really warm welcome at the train station and a nice ride to their home. When we arrived and during the great dinner, the conversation went on very easily because we had a lot of things in common, for example similar interests in culture, movies and sports. We admired their smart solutions for storage and the estatic interior design. And to drink sometimes a sake before having a good meal. We also talked about the actual political situation in Japan and in Germany, and we learned a lot. It was very relaxing in their home and we got a very good impression of the Japanese home-culture. It was a unique experience, to meet people in their home and not just doing touristic activities like sightseeing. It's important to us, trying to meet locals while we are traveling, to get an impression of their life and culture. We tried to do our traveling unprejudiced. After the Nagomi Visit we feel confirmed, that it is important to meet people. We noticed, that we've got a lot in common, despite the cultural differences. One thing, what was surprising for us was, that more Japanese people are having problems to digest alcohol than we expected. When I booked the nagomi visit, everyone was very excited. No one was nervous or scared. Sawako also made the visit stress free for us by meeting us at the train station and walking us back as well. Our children were comfortable with the host’s home and children in a matter of minutes. They could not communicate verbally, but they had fun folding origami together and engaging in physical humor. Our kids did not recognize some of the food, and thus avoided about half of the offerings. However, everybody was able to find plenty to eat. I would not want the host to attempt to serve more American style food as that would detract from the purpose of the visit, which I see is a sharing of cultures. The nagomi experience was wonderful. We will certainly do it again when we return to Japan. We also have maintained contact with the family and are friends. They are welcoming, kind, and generous. We will certainly visit with them again. As a parent, I was amazed at how well the children got along and played together. The activity was very different than any other activity we did on our trip, but was perhaps the most special. We enjoy meeting people, and we admire Japanese culture. 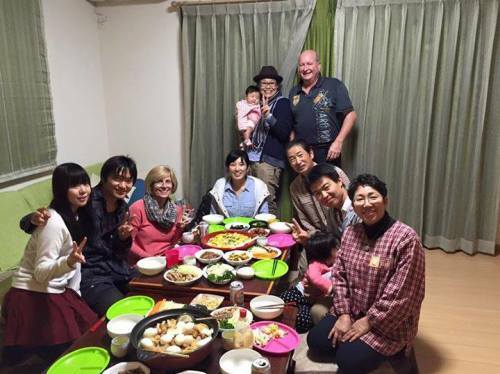 So, being able to spend time with a Japanese family was an amazing opportunity for our family. I read about Nagomi Visit in an Instagram-Post and was immediately hooked, but when I told Felix about it, he was a bit skeptical. We are both not too outgoing, so visiting people you've never met, and whose language you don't speak, "just like that" probably felt a bit weird. But I was pretty excited about that idea, so he agreed - and in the end we are more than happy about our day with Naru and Kaori. Naru and Kaori met us as the train-station, well prepared with a map and additional info-material (they're quite experienced Nagomi Hosts). They are a lovely couple and I wrote some emails with Naru beforehand, so I felt no need to be nervous. We went for a stroll right away, and learned so much about Nara and Japan in general. Naru even brought his camera and shot some photos. 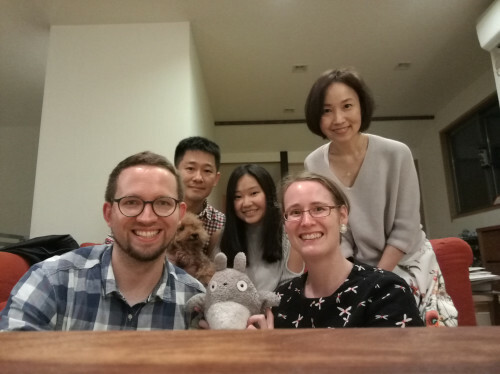 We learned most by talking to Naru and Kaori, who patiently answered thousand of questions, but of course, we saw some interesting differences to German/European apartments. Just go for it and don't be afraid! My son and friend were 16 so they warmed up right away with the host family and played with the little boys. We brought them mini hockey sticks as gifts and showed them how to play hockey with them. They enjoyed all parts of the meal but it felt very special to have Tempura made fresh. I also have allergies to wheat flour and they made special tempura for me with corn starch. They really made us feel special. Even the presentation in bento boxes was beautiful. As a parent, it was great to see the boys playing with each other even though they didn’t speak the same language. They had a lot of fun. Having the boys definitely helped us interact with the little boys better. It also gave us lots to talk about, comparing school and activities of the kids. It was nice to socialize with a family and was relaxing. We like to travel and it was so nice to experience more than just being a tourist. We were not nervous and it was one of the highlights of our trip, both before and after. I found out about Nagomi Visit on a travel website and was immediately thrilled. My wife feels very much the same about traveling and meeting locals, so it wasn't at all difficult to convince her that we should try it out. We were both positively surprised how many answers we got following our request, and the hardest part was to actually choose but two of them. My daughter was a bit shy at that time (18 months old), so she didn't really get into contact with the kids. Instead, she played with their toys (which they gladly allowed) and kept close to Mum and Dad. She loved trying on the baby yukata our second host family provided. She also loved watching the moon from the first host family's balcony together with their daughter. Both my wife and I have travelled widely (and also to Asian countries), so we weren't nervous. We were greeted in such a friendly way that any rest of nervousness would have disappeared immediately anyway. Both Nagomi Visits were really quite relaxing as we could get out of the heat and let our daughter play in safe surroundings. My partner Sirio was enthusiastic and happy to share these experience because we are curious and interested to know different people and cultures during our trips. We was very excited, probably a little worried at first, but then not. During the first in Tokyo, the family was numerous and funny, it was very simple to start conversation. Also, in Osaka, the Miss who hosted us was very interesting person and we have talk about everything. It was a very important experience to know new things about Japanese culture, daily life, food, religion, society and life organization. When I decided to participate to Nagomi Visit I could try to go to one host in every stop of our journey and where it was possible we took advantage of it because I think is one of most important opportunity to know and meet people of different country like Japan. 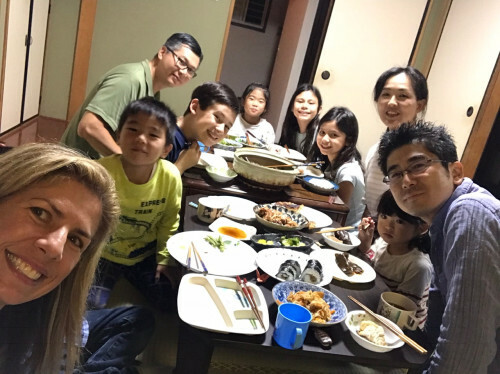 We have been visiting 3 familys on our 14 days trip to Japan. We did not plan this, but we became so many nice invitations after applying on the plattform, that is was just too difficult only to choose one! Every visit was very unique and individual and we enjoyed every single one. The hosts were all very friendly, very good organized and concerned about providing us a perfect dinner. We had a lot of fun and good conversation and time went by so fast! The hospitality was overwhelming! Our first hosts shared their honey moon experiences at Switzerland & Germany with us. We really appreciated their interest for our country and their openmindness. Another host let us make our own Sushi with Tofu - never did that before and it was lots of fun. Also one of our hosts makes her own porcelain art and we had dinner on some of her plates. So beautiful! Yoko was very friendly. We emailed a number of times before the visit. I felt that when we met we were already friends. Yoko kindly met us at the station with her children and drove us to her lovely home. She made us feel welcome and was very good at making us feel part of her family. Yoko's children were lovely. They made my children feel welcome and it made the visit a bit special in that the children were roughly the same ages with similar interests. Our children all love anime and manga so they talked about their favourite movies and books. We loved the dog and showed Yoko a picture of our dog. We ate the goyzas we had folded and the okonomiyaki Yoko made. We also had a lovely macha pudding. 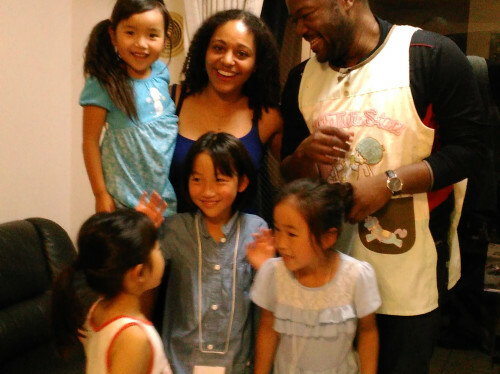 My children loved meeting a Japanese family with children their age. Nagomi Visit is quite a life-altering experience for me actually. We were very nervous meeting her & her friend because we were afraid there wouldn't be any topics to talk about, being awkward and stuff. Instead we shared a lot our travel stories & our different cultures! She did a very pretty board with our names on it, welcoming us at the station. It was so prettily done we had to bring it back home. It was also very interesting hearing the life experiences her & her friend had and they seemed very interested in coming to Singapore too after describing to her our lifestyle. She brought us to a nearby supermarket and it was really an eye-opener! Her friend bought a strawberry daifuku each for us at a local snacks/sweets store before heading to her place. She has a clean & cosy apartment and cooks really well! She also surprised my husband with a homemade chirashi birthday cake, gave us gifts with heartfelt handwritten messages folded into pretty shapes! She did mention she will be doing a "birthday cake" but all I expected was just the home cooked lunch being a celebratory meal (I didn't tell my husband), we were totally surprised when we saw it. I totally didn't expect she would really make a cake out of rice and sashimi! She is too sweet! We also ate boiled french beans with sesame seeds, miso soup with sweet & fresh clams & pan-fried marinated chicken with grated daikon. Before leaving the house, she gave us 2 handmade gifts and another 2 more daifuku since we love it so much! We still keep in touch. Well done Nagomi Visit! The program is fantastic! We will be joining Nagomi Visit again when we venture out to more rural areas of Japan the next time. A warm family, enjoyable evening and a lifetime experience. If one goes to Japan and doesn't take a Nagomi Visit you spoiled an opportunity that lasts for the rest of your life. 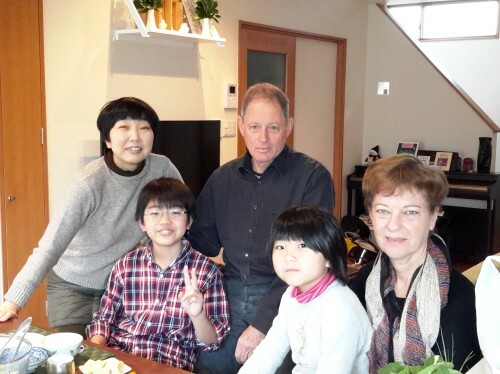 Misa and Kazumi and their kids in Hiroshima are wonderful people. Very open and entertaining. The time to talk with them was too short. Lovely people we will stay in contact. [We talked about] family, food, habits in our country and Japan, work, traffic, a very diverse conversation. Of course only to have the possibility to enter in the daily live of our host is already a beautiful experience. It is like visiting friends you know for many years. [We ate] okonomiyaki, rice sushi and some sweets. Some people react: Completely strange people you never met? 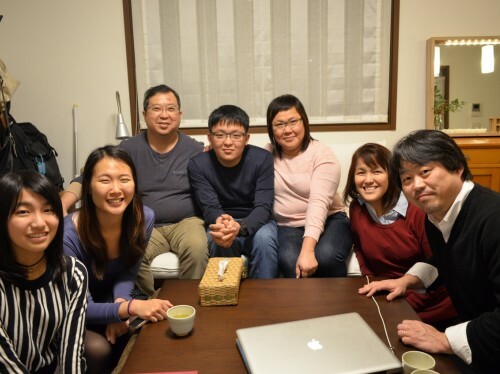 But when we explain what Nagomi really is you know that these people who participate to the program have about the same ideas and are as curious as yourself to meet new friends. [Our most memorable moment was] waiting for our host in a small station outside Hiroshima. The two responsible of the railway thought we were lost. Suddenly one of the kids of Misa showed up from the dark with a paper with our name written on it. This was really cute. Yes we will [keep in touch with our host]. 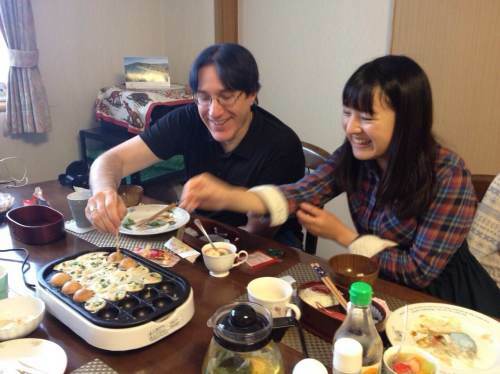 Last year in 2015 we had our first Nagomi experience in Tokyo and we are still in contact with Mutsuko. Hiroki and Tomoko brought us around a nearby supermarket and shared with us common Japanese food and ingredients, before heading to their home. We talk for hours about our mutual interests - especially our love of Japanese food and culture - especially our fanship of all the Japanese mystery dramas. Also shared some interesting facts about our home Singapore. The kids had a common interest in Japanese anime and we spent some time hunting down the latest anime episodes and news. We ended up being friends on Facebook, so that we can continue to keep in touch in future. We found out how easy it is to cook tonkatsu (one of our son's favourite Japanese food), as well as some of the cultural nuances of Japanese live (like why they don't sing karaoke at home ;p). Tomoko showed us how to prepare and cook cheese tonkatsu - very delicious and definitely something we will prepare back home. We also made our own onigiri - and had lots of fun with them. Tomoko also brought out miso soup and potato salad. We brought along some dessert snacks and we had them after the dinner. We most enjoyed the part where we all participated in making the onigiri - Hiroki was very humorous and we had lots of laughs in the process, which really helped to break the ice. Our host are a fantastic couple. They are really GREAT!! We talked about our life in Germany and our family as well as the life of our host in Japan and work in Japan. Yes, we made a lot of new discoveries. The first course included vegetables, tofu, pickles, seaweed, salad - all served in lovely small Japanese bowls. The second course was a soup with a lot of ingredients (like Kenchinjiru). It was cooked from hostess Izumi. The third course was cooked from Tomio, Izumi’s husband: steak with salad and rice, served in wonderful Japanese bowls. Also we had a dessert, nice decorated with fresh fruits. Additional we had Japanese beer and tea. The dinner was excellent!! The meeting with our host was one of the most impressive events we ever had in Japan. 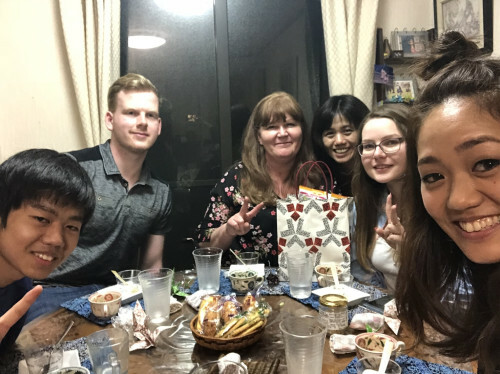 The friendly welcome, shopping in a supermarket, the nightly trip through Shin Osaka and the fantastical dinner in their flat we won't forget it for ever. The most memorable moment was, when Izumi picked us at Shin Osaka station (her smile, the pretty sign with our names). Nearly every day we exchange E-Mails. The gained friendship with Izumi and Tomio is a great motivation for us to learn more of the Japanese language. At first we did not know what to expect from Nagomi Visit. But after we went through with the process and chose a host family, it was smooth sailing. 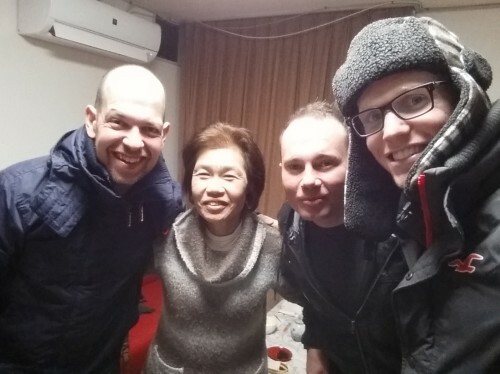 Yuki-san contacted us through email and we exchanged salutations with some small talk. We were anxious up until seeing them at the train station were Yuki-san was waiting with a welcome sign. Immediately we felt relief the more we talked and got to know Yuki. She introduced us to her family and then began prepare for mochi pounding. It was the first time we ever seen this and we were even able to participate in it. We had fun using the mallet to compress the rice and make mochi. It was very tasty. 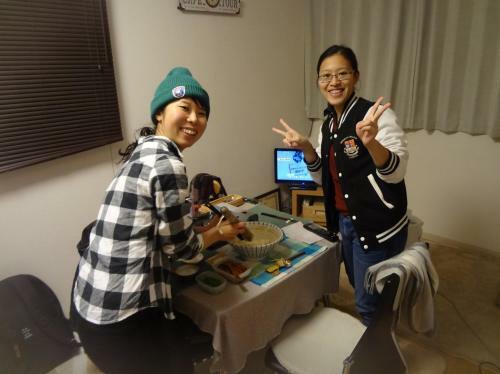 After that we spent time talking to each other while they prepared Japanese New Year foods such as osechi ryori, ozuni, and other foods. I liked it how they explained each dish and its significance to Japanese culture. We laughed and had a great time over dinner and some drinks. Unfortunately, we had to catch the train back to our hotel; so they walked us to the station and said our farewells. Our second trip to Japan was enhanced by Nagomi Visit. 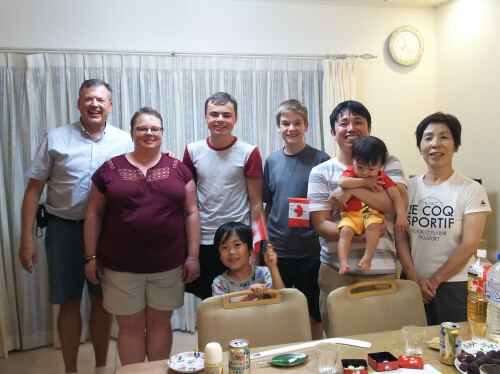 We really appreciated the time Yuki-san and her family took to meet us and show their traditional values and customs in Japan. 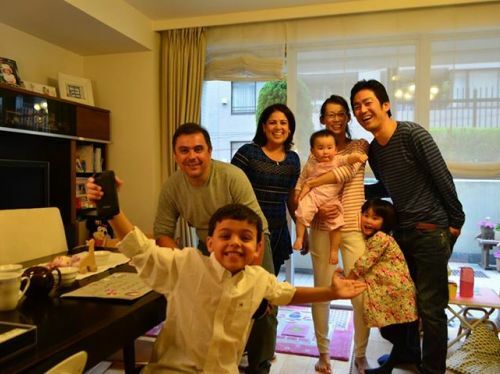 There is nothing that can replace the experiences we had with Yuki-san and her family. 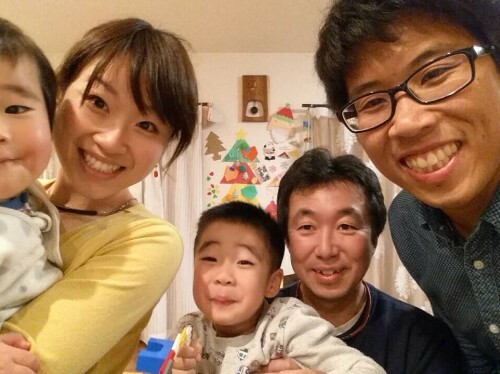 If we had a choice, we would meet Yuki-san and her family again next time we come to Japan!! Misa was my host in Hiroshima. Both her and her husband Kazumi are elementary school teachers. They have two sons, who are very talkative and active. Misa was very friendly and the whole family made me feel at home. Both Misa and Kazumi are around my age and that made for easy conversation. We talked about each others school and work experiences. Misa and I swapped travel stories, while Kazumi told me how to make okonomiyaki. They were also curious about how my trip in Japan was going and where I had visited. We ate homemade okonomiyaki. Kazumi was a very good teacher and went through the process step by step. I wasn't sure if I could do it but his coaching helped a lot. After the meal, they served homemade mochi and fruits, which were very good. My most memorable moment was helping to cook dinner. I really appreciate that they allowed me to help and to learn something interesting in the process. 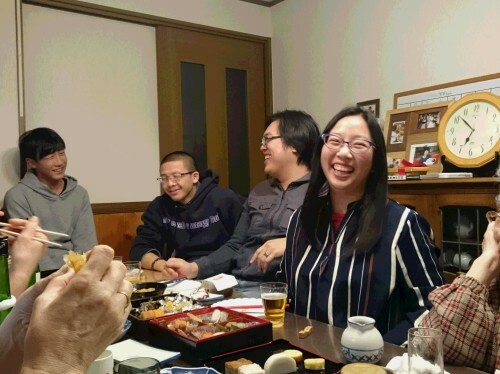 We had an amazing home visit in Hashima (near Gifu/Nagoya) with Michiko and her family (parents, husband, daughters, sister and partner, cousin and husband). From the moment we met at the station we felt like we were old friends.They took us for a tasting at the dessert shop so we could taste and then select dessert for our dinner. 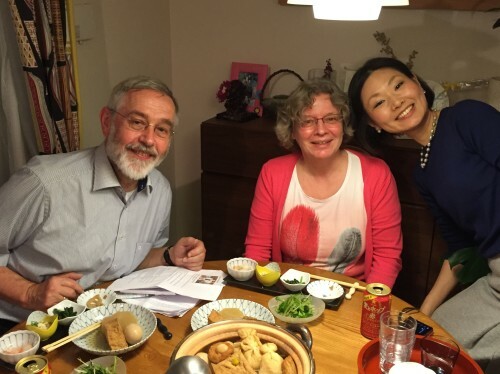 We had a lovely meal in their home (so much to choose from), Michiko's father showed us how to do calligraphy and her mother dressed my wife in a Yukata. 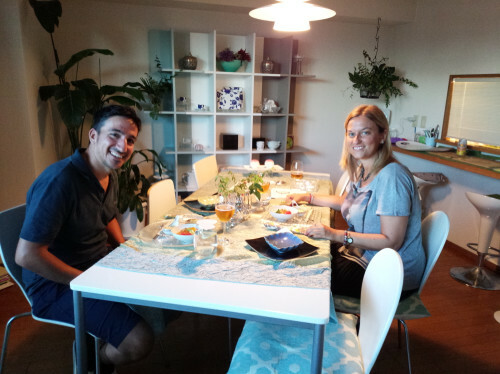 It felt like a family dinner , They welcomed us warmly in to their home. This was the highlight of our trip and we would recommend a home visit to anyone. My Nagomi Visit was such a unique experience, and it truly was a highlight on our entire trip. Katsue was the most welcoming host and so extremely friendly that she made us feel at home the moment we arrived. We shared stories and chatted/laughed for hours as if we had known each other for years. Tempura + local beer and good conversation was had by all of us and it was truly a special night. We still keep in touch and when back in Japan, I will visit our new friend once again. I recommend everyone try Nagomi Visit, you will have an amazing time! We were fortunate to meet such a lovely family. Akira, Kumiko,Kaho and Nana were the best Nagomi hosts we could ever have, and we felt very welcomed. Food was delicious, and beautifully presented. They even took care about my wife's food allergies and made a menu accordingly. We really enjoyed the conversation, all the experencies exchanging,and of course, the Kaho's singing! Time has passed to us on a breeze. All in all, we can say that we had a very pleasant and delightful time with them. It was a honour to be with this beautiful Japanese family. Arigato Akira, Kumiko,Kaho and Nana and Nagomi visit for this amazing time! This my 2nd Nagomi visit during my trip. My hosts put a lot of effort into the visit from origami cranes to playing my national anthem on the piano! The food again was great and totally different from my other Nagomi visit. My hosts this time lived in a more rural area and it was great seeing this different side to life in Japan. We all chatted and laughed the entire time and the conversation was very varied, they recommended a few places for me to visit and they even taught me some origami. I recommend anyone coming to Japan to do at least one Nagomi visit as it shows a side of Japan no tourist spot can. We enjoyed the meeting with Morita family very much. It was a great opportunity for us to share mutual experiences of our life in two different societies. 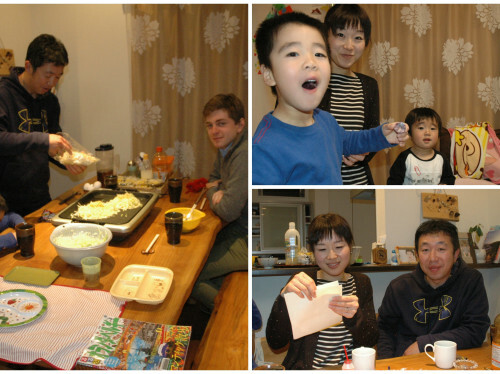 We also experienced the home made Japanese food which was delicious. Thanks for the attention and thanks to Morita family for the hospitality. Nagomi Visit was certainly one of the most memorable activities during my trip to Japan. 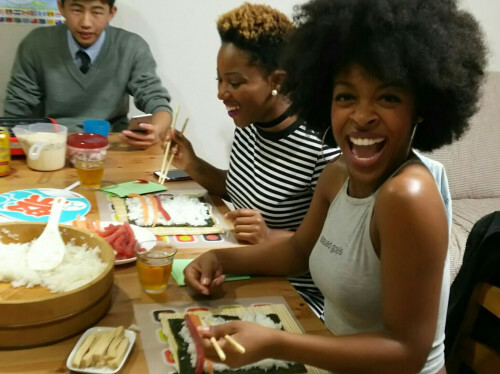 I've always loved meeting locals as I feel that it's the most authentic way to experience Japanese culture. 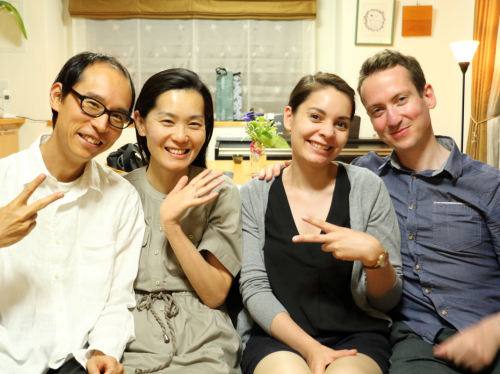 I had a great time being hosted by Saki-san and Yuta-san in Osaka. Saki-san had rushed down from work to meet me at the train station. We had an extremely delectable meal of chanko-nabe (hotpot), buri-daikon (simmered yellowtail with radish) and shiraae (white salad). They had modified their menu to suit the winter season, which was a sweet gesture! I especially enjoyed the specialty dessert takoyaki, cooked with different fillings. Not only did I experience making takoyaki for the very first time, we played a little game whereby we had to avoid choosing the one with the sour plum. We talked about everything - the best places to go in Japan, introducing my own country and so on. As all of us had interest in martial arts, they also introduced me enthusiastically to Shorinji Kempo. 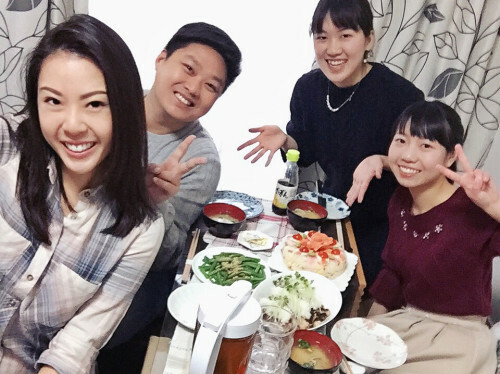 We had such a fun time that Saki-san and Yuta-san met me again a week later, where they invited me to lunch and brought me around Osaka. Their hospitality knows no bounds, and I cannot wait to do the same for them should they ever come over to Singapore! Our visit at Mari's house was just perfect! She send us all the information we needed in advance and we didn't have any problems to get to her hometown. She picked us up at the station and brought us to her house. 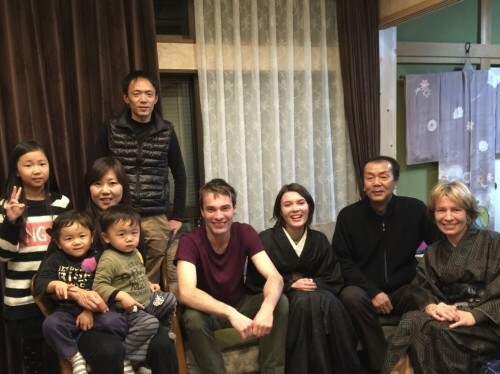 Since this has been our first visit to a Japanese home she explained everything to us. She had asked us in advance if we would like to have traditional Japanese dishes - and of course, we loved to! Mari prepared some very tasty dishes and presented them beautifully. She even wrote down the menu in a lovely Japanese calligraphy for us. After dinner she showed us how to prepare and drink Japanese Matcha. She is a perfect host and an interesting person, we had a lot to talk about and also a lot of fun! We will recommend Nagomi Visit to all our friends!